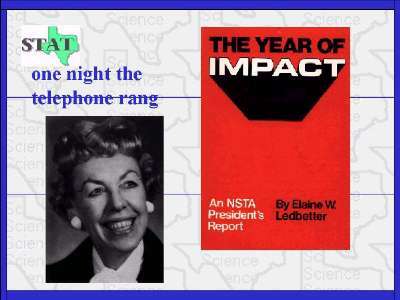 This is an interesting connection, reporting the first chapter of Elaine Ledbetter's book THE YEAR of IMPACT during which she was the National Science Teachers Association President. The chapter begins with "One night the telephone rang" when Malcolm called Elaine to inform her that he wanted her to accompany him to the National Science Fair. This trip encouraged Elaine and gave her new faith in teaching, and she went on to become the NTSA President, Look Magazine's Teacher of the Year, as well as STAT Vice President and President.